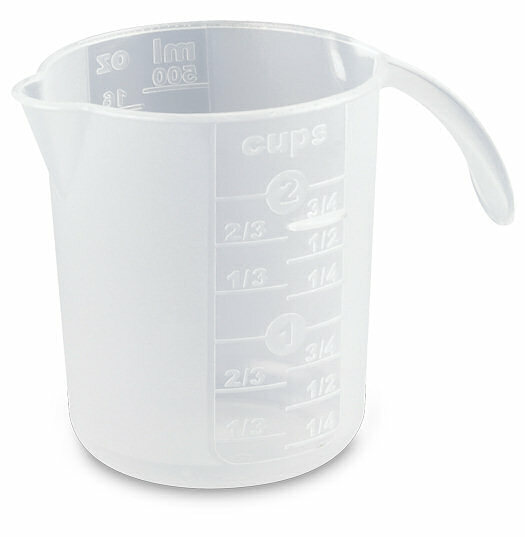 The Measuring Cup features a 2-cup graduated English/Metric scale for easy conversions. An ergonomic handle and narrow spout allow for controlled and natural pouring of liquid contents inside. This measuring cup has embossed marks to ensure that the measurements won't fade. 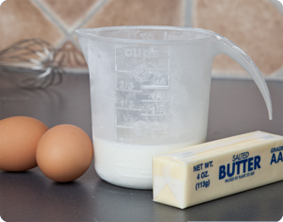 The measuring cup is durable and dishwasher safe for easy cleaning. Its clear build allows for contents inside to be easily seen and guarantees that recipes can be precisely measured for accurate proportions. This measuring cup is ideal for pouring and calculating liquids for baking, arts and crafts, food preparation and much more. All Sterilite food preparation products are BPA-free and phthalate-free. The overall dimensions of this item are 6 1/8" L x 3 7/8" W x 4 3/8" H.
Overall Assembled Size: 6 1/8" x 3 7/8" x 4 3/8"
Ideal for measuring and pouring liquids for baking and food preparation. 2 Cup Measure is rated 5.0 out of 5 by 2. Rated 5 out of 5 by Carole Anne from MAGNIFICENT PRODUCT! I have several all over the house! I absolutely love this 2 cup measure!!!! I keep one in the kitchen for cooking. I have three in the laundry room: laundry detergent, bleach, fabric softener or bluing. They are MAGNIFICENT!!! I have several in the garage; one in the garage to measure out the dog food; one for mixing paints or stains for projects and I use one to pour gasoline in the weedeater without it running all over the place. This product hold up well, to my clumsiness, I drop knock over, close cabinets on; you name it...I do it! No other product holds up like this does! Rated 5 out of 5 by Cinjopo from No more faded measurements from washing in dishwasher I have quite a collection of liquid measuring cups. All are glass. The problem with these cups is that after multiple washings in the dishwasher, the printing on cup fades so much that it is unusable as a measuring cup. 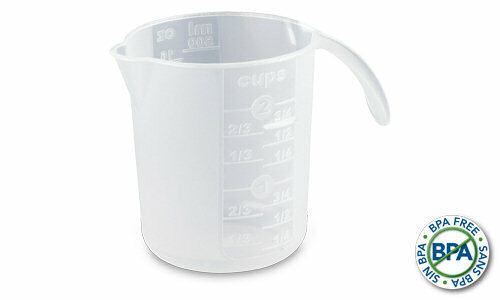 This liquid measuring cup, however, has the measurement markings molded into the plastic! When I found them, I purchased 4 of them, have been using them daily for many years, and they still look new. As long as you don't melt butter in them, it is plastic after all, they should last a lifetime.